Incoming Chelsea manager Antonio Conte says he feels "stronger" after being cleared of any wrongdoing in a match-fixing scandal from 2011. 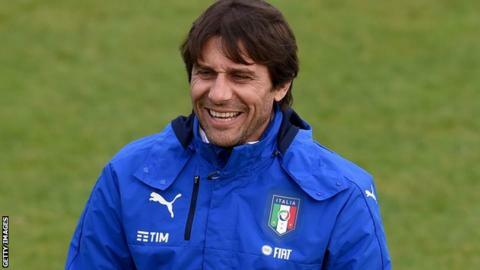 The 46-year-old, who will lead Italy at Euro 2016 next month before joining Chelsea, was accused of doing nothing to halt a scandal while boss of Siena. But a judge in Cremona acquitted Conte because the accusations were baseless. "Today finally draws a line under this ugly story," said Conte in a statement on his official Facebook page. "Four years ago, a search of my house at 5am ushered in a nightmare period that at times I felt would go on forever. "Those who stood by me, and who know me best, know how much I have struggled with the idea that my name might be associated with the shameful world of match-fixing." In August 2012, while coach of Juventus, the former Italy international was banned for 10 months for not reporting alleged match-fixing in two games involving Siena in the 2010-11 season. This was later reduced to four months by an Italian sports tribunal and Conte became coach of his national team in August 2014. "I thank my family and the many people who never believed even for a moment the words which presented a false image of my lifestyle," he added. "I am a sportsman and I know no other way to achieve success than through sacrifice and total dedication. It was a terrible experience and I have faced it head on. "To all those who never doubted my honesty, I want to express my gratitude, and reassure them that I have emerged from this testing time as a stronger and more highly motivated person."